Media: Soft cover; 9" x 12" format; 196 pages plus covers; more than 400 photos and 37 colour profiles. Advantages: Superb collection of over 400 photographs, 24 pages devoted to 1/72 and 1/48 scale general arrangement drawings, proficient artwork and interesting text. Two-seat aircraft do not usually get the same attention as their more fancied single seat cousins. When these two-man “fighters” are from the SPAD company, the popularity factor declines even further. This is a pity as these “lesser” types were produced in great numbers and made a significant contribution to the war effort. Flying Machine Press has seen to put this right with the 192 pages presented in this publication. They have drawn on the talents of numerous researchers, each contributing to a specific aircraft type. The first thing that strikes you when opening the book is the remarkable collection of photographs. Due to the nature of the subject, there are plenty of images that readers will be seeing published for the very first time. To have such an assembly contained in a single volume is very welcome indeed. The photos are generally printed two or three to a page, thus allowing maximum benefit to be gained from each image. 37 colour profiles are contained in the book and these were left to the capable hands of Bob Pearson. The SPAD SA series is represented by twelve examples with the majority of the remainder being the SPAD 11. Marty Digmayer has been busy supplying twenty four pages of General Arrangement drawings. They are in both 1/72 and 1/48 scale and five aircraft are represented. These are the SPAD S.A.2/S.A.4, SPAD 11, SPAD 16 and SPAD 20. After a useful introduction to the development of armament, the book opens with the SPAD SA series. Christophe Coney wrote the majority of this when contributing to the French aviation magazine Avions. As well as discussing the prototype, the writer describes the S.A.1, S.A.2, S.A.3 and S.A.4 series of “pulpit” fighters; including the many strange experimental derivatives. All aspects are covered, including a detailed narrative of the development, structure, performance and operations of these aircraft. Here we find that a SPAD SA. actually scored a confirmed victory, this remarkable event being described in the text. Sketches accompanying this section help explain some of the more subtle aspects of the S.A.1 and S.A.2. Rounding out this chapter are notes relating to almost every one of the SFA-numbered machines built. Looking very much like a scaled up version of the SPAD 7 fighter, the SPAD 11 is presented to the reader in the next installment. Colin Owers did the “lion’s share” on both this and the next chapter, which again gives detailed notes on the history and structure of the aircraft. This is complimented by enlightening commentary from members of the aircrew that found themselves occupying these machines. The SPAD 11 equipped several French squadrons as well as providing service to the Belgian and United States Air Services. These contributions are documented here with a useful resume attached to each Escadrille. A change of engine from the Hispano-Suiza to the 240hp Lorraine 8Bb resulted in the SPAD 16. Apart from the period photographs, we are blessed with 68 close-up images of Colonel Mitchell’s SPAD 16 which was on display at the National Air and Space Museum in 2004. These are perfect for those that wish to model the finer points of this aircraft. 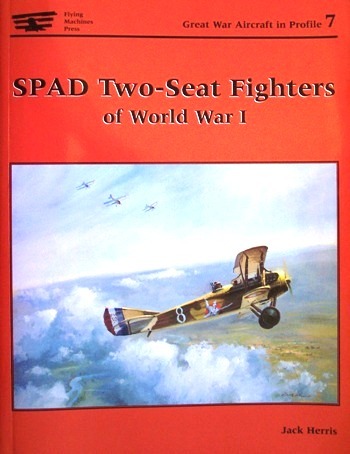 The book is rounded out with a brief look at the SPAD 20. Although not really relevant as far as World War One is concerned, it is included for the sake of completeness. The 192 pages of this publication make for fascinating reading. SPAD two-seaters are an often neglected side line when it comes to published information. It’s a pleasure to see this remedied by a book that encompasses all the significant designs, and does so in such a thorough fashion. With the rare collection of photographs, scale plans and comprehensive artwork, modelers and kit manufacturers alike should have no trouble in appreciating these forgotten subjects.